In a recent interview with Channel Four News, Dowson admitted to pursuing a "holy war" on the streets of Britain. Members of the far-right, pseudo-militia group Britain First have "invaded" a mosque in south east London in protest at the building’s separate entrances. A bizarre video, overlaid with some very dramatic music, sees the paramilitary-clothed activists "inform the Imams that they have exactly 7 days to remove sexist, segregationist signs from outside their building, or we will”. Like most mosques, Orthodox Jewish synagogues and Sikh gurdwaras, the North West Kent Muslim Association conducts acts of worship on the basis of gender separation. 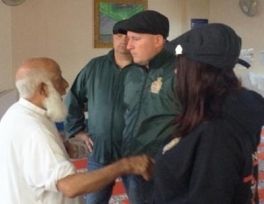 But, the Britain First "Kent battalion activists" can be seen forcefully telling one elderly man at the mosque that they "object" to the signs. "In this country we have equality," one member says, as the Muslim man protests over the group refusing to take off their shoes in the place of worship. "When you respect women, we'll respect your mosques," they argue. They then demand the mosque "cover up" a cross on the front of the building, saying "it's offensive to Christians… you don't believe in Jesus." A statement on the group’s website under the headline "Britain First Activists invade Crayford mosque", said: "Islam treats and views women as second class citizens. The controversial group is led by a former BNP councillor, Paul Golding, while their political guru, Jim Dowson - a hardline evangelical anti-abortion activist - was previously in charge of BNP finances. Syed Alam volunteers at the mosque, which has signs reading "Brothers only" and "Sisters only" above two gates either side of the main door. He told News Shopper that five men and one woman from Britain First stayed for up to 10 minutes harassing a handful of members who were there. "They are filthy people creating trouble in our society," he said. 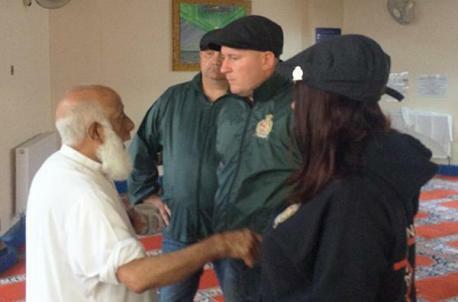 Britain First is the most active far-right group to emerge from the collapse of the BNP and EDL over the last year. The group's Facebook page has more than 350,000 “likes” - making it more popular than the Conservatives, Labour and Liberal Democrats, and arguably making it the UK's biggest political Facebook site. Files released by the Hope Not Hate group suggest that as many as 2 million people could be interacting with Britain First content online each day. However, behind the social media facade apparently lies a small but dangerous group of religious fundamentalists intent on starting a holy war" on the streets of Britain, according to a recent report. Hope Not Hate claim the group has links to far-right protestant extremism and Northern Irish terrorism.